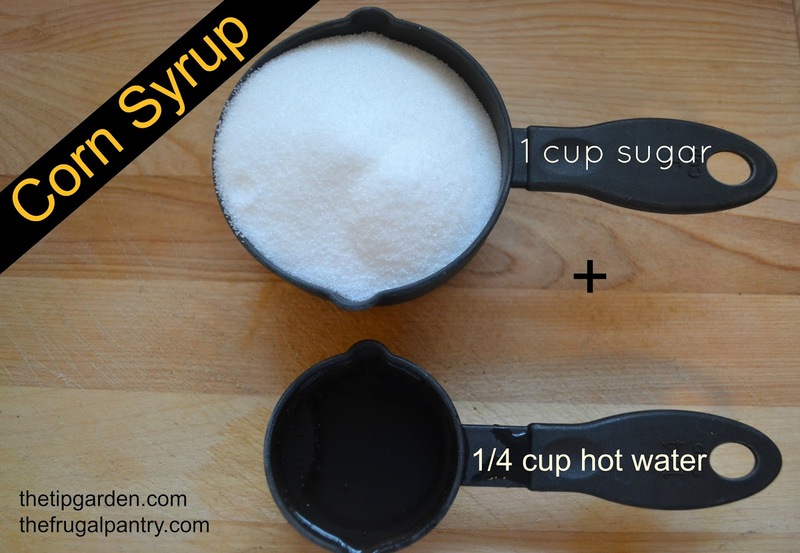 Making your own corn syrup couldn't be easier! Do you ever find yourself in the middle of your holiday baking, sure that you have enough corn syrup and find out that low and behold you are either out or do not have quite enough for your recipe? Me Too! Recently I was making a batch of Smore Bars and needed only 1/4 cup of corn syrup, but I was out! So I just made my own to get me through, and it worked perfectly. Q: Can anything be substituted for the store bought corn syrup? A: Yes! depending on what you are using it for and if it calls for dark or light corn syrup you have a few options. Honey is an option that should work in most recipes and you can make your own corn syrup to get you through. Q: Is the homemade corn syrup the exact same as the store bought? A: Not the exact same. We are only trying to create a substitute version. Store bought corn syrup is stabilized to avoid the sugar crystallizing. 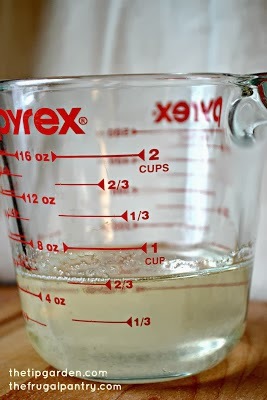 Homemade corn syrup can get some of the sugar to crystalize after it cools down. It will work in most recipes but if you are a serious candy maker you may want to stick with store bought for those hard candies or specialty recipes. But your average person can use the homemade in most of your baking/cooking. Q: What do I do if my corn syrup does crystallize? I have TWO recipes for you today. I use them both. The first is my "in a pinch, middle of a recipe" rescue, and the second one is my "make my own large batch" plan ahead recipe. Perfect for when you are in the middle of your recipe and come up short. This will keep you from running to the store and is great for treats, frostings,etc. I've got ingredients for both light and dark corn syrup included. 1/4 cup nearly boiling hot water. Stir together till sugar is dissolved. Jan's tip: If your sugar is not quite dissolving, heat the mixture in the microwave for 30-45 seconds. That should heat it enough to turn it into syrup. This version add's a bit more authentic corn taste to the syrup. No worries, it does not come out tasting like corn on the cob, just a touch of the corn sweetness that is in commercial corn syrup. I first came across it at Brave Tart and have adapted it just a little. 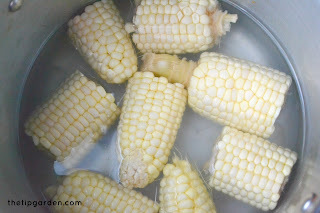 Slice or snap corn on the cob into smaller chunks. (I snapped mine into thirds. I cut part way through the cob till I hit the center and then just snapped at the precut line). 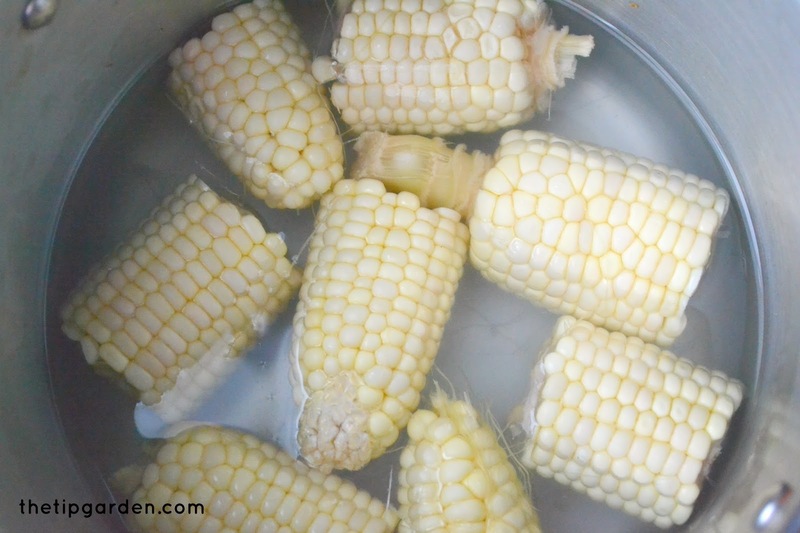 Bring medium sized sauce pan with the water and corn to a boil. Reduce heat to medium and let simmer 30 min. or until water is reduced by half. strain out all of your corn from the pan. Add sugar, salt and vanilla to the pan, stir until sugar is dissolved. Using a candy thermometer cook to soft ball stage (235 °) stirring occasionally. Remove from heat and let cool until ready to use. When ready to use, if you have a few sugar crystals, microwave it with just a little bit of water to gently melt those sugar crystals before using.